Dero Fabrication is well-known amongst machinery suppliers to the food and pharmaceuticals sector and a new acquisition promises even further growth. The name Dero Fabrication is misleading because, when you visit the company’s 10,000 sq ft facility in Worcester, there is much more than just fabrication going on. is well-known amongst machinery suppliers to the food and pharmaceuticals sector and a new acquisition promises even further growth. The company was founded in 1977 as a maintenance fabricator, but over the years has found that there was increasing pressure from customers to bring everything in-house. “We were spending a lot with sub-contractors to cut the sheet metal profiles, but we needed quicker turnaround times and that meant bringing everything in-house,” says Production Manager James Taylor, whose father, John, owns the business. The company now offers an end-to-end service for customers, from conception through to design, product development, prototype work and finally production. Most importantly, Dero provides all the services required without resorting to subcontracting, including laser cutting, assembly, welding, fabrication and finishing. The introduction of laser cutting technology in 2004 was crucial. “That was a big step for us and enabled us to carve out a very strong position in the food and pharmaceuticals sector,” says James. The company now manufactures everything from gantries and stainless steel frames, through to guards and chambers for food process equipment. In tandem, Dero has also developed a specialism in ultra-high standard finishes that are particularly valued by the pharmaceutical sector, including powder coating, galvanising, glass bead blasting, plating, anodising, chemical blacking and a number of bespoke finishes. However, with growth has come pressure on production. 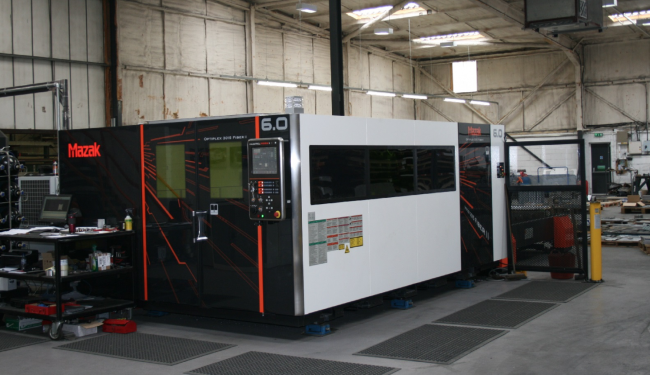 “The 4kW CO2 laser we had was struggling to keep up with our production demands,” says James. Yet, the OPTIPLEX has also opened up new markets for Dero. “We have one client who previously used water jet. They would send components out to the water jet company and then get it back for machining and finishing. We are taking over all of the processes and quoting it as a package, including framework and cabinets. We send them machine fabricated parts that they can just bolt together,” he adds.